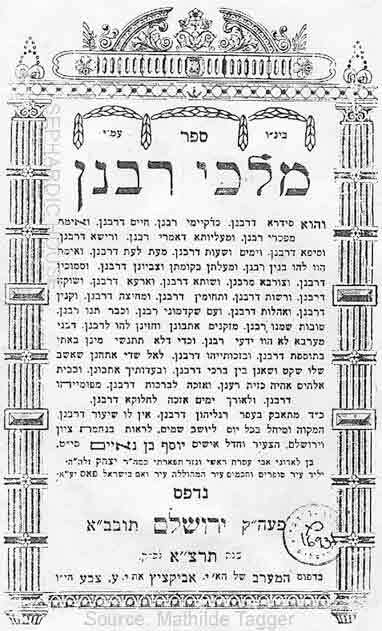 Index of Ben Naim, Yosef. Malkhei Rabanan. Jerusalem, 5691 (1931). On Morocco Rabbis: Malkhei Rabanan, written by Rabbi Yosef Ben Naim, is a biographical dictionary of Morocco Rabbis. Published in Jerusalem in 1931, the book is an essential source for anyone dealing with the Moroccan Rabbis and their printed or manuscript writings. the Rabbis' given names without any logical order inside a single given name. Another disadvantage is the fact that the whole book is written in archaic Hebrew language and style. While indexing this dictionary, I tried to make a compromise between the strict rules of transliteration and the common spellings of the names. The book of Abraham Laredo "Les noms des Juifs du Maroc. Madrid, 1978" was used in many cases as a reference. As to the given names, there were not any problem. I have respected the numeration given by Ben Naim, when people with the same surname had also an identical given name. That's why the reader will see for example: Aben Danan Saadia I, Aben Danan Saadia II and Aben Danan Saadia III. Where it was clear enough, the father's and even the grandfather's names have been added. The Hebrew calendar was used in the original and so I did. That's why you'll find dates like 5349 or 5620 etc.. I would like to underline the fact that the role of Rabbi was very often hereditary. This point is enlightened by some big Rabbinical dynasties like the ABEN DANAN (37 Rabbis), ABENSUR (32), BERDUGO (35), SARFATI (30), SERERO (26) and TOLEDANO (53). 1,700 names have been indexed, covering a period generally beginning from the time of the 1492 Expulsion from Spain till the twenties of the 20th cent. Data on this page has been assembled using the Adobe© PDF File format. To view these, please install the Free Acrobat Reader. Once installed, it will launch automatically. If you need help with AOL, click here. 4-5th cent. between the 4th & 5th cent.